Most name brand carbide bits will do the work so look for the shape you want and then the price. Woodcraft carries Freud and Whiteside which are both good products. One tip for making the T slots is to first use a straight spiral bit to cut the main slot or groove to remove the major part of the wood. Then use the T slot bit to cut the side channels. This process makes for a smoother cut, allows the sawdust to escape better for each cut and with some hard woods will avoid burning. make some kind of rigid form (sled) for the router to travel firmly in a straight line. off course and then you have an ugly looking track. (voice of experience speaking here). Les has given a great tip. (wish I had known it years ago). but, then again, a serpentine track may be more versatile than just a straight line. I strongly suggest practicing on similar material prior to using it on your bench. as for bits – I have some that are over 40 years old. most are carbide, some are not. the price will be cheap and I consider that one to be “disposable” after it chips and gets dull. (or breaks). if you are a novice or hobbyist in the router dept., most any bit will do for small, infrequent projects. once you do more router work, then you can move up to the more expensive hardware. (just my opinion). Totally agree with John. I’ve tried to free hand with my T slot router bit. It really follows the grain of most woods especially any hard wood. One of my go-to places for router bits and such, is MLCS….They carry a good selection…...I’ve bought from them for years, and have never been disappointed…..!! And the prices aren’t bad, either…compared to other places and brands…. I’m planning to build a finger joint jig. That is the first project I have for a T-slot cutter. I haven’t chosen the wood for it yet but it may just be mdf, I don’t know. Thanks for the tips guys. I have a spiral straight cut bit to work with the slot cutter. Warning! 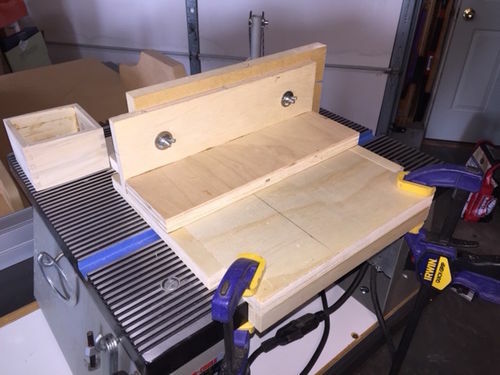 I built a CNC router spoil board out of MDF with “T” grooves routed into it instead of using countersunk T track. The MDF wasn’t strong enough and started crumbling the first time I tried to clamp down a work piece. If you are using MDF, take it very easy on the clamping force. By the way, I cut the grooves on a router table. I would hate to try to do it with a router and a straight edge. You might consider cutting your t-slot into a piece of wood 1st, then setting the wood into a dado on your table top. As ArtMann said mdf won’t be very strong. And you can make it safer using your router table. If the side slots (the cross on the T) aren’t deep enough (vertically), you can easily deepen them simply by extending the bit a bit further. No need to have the exact profile if you need to accommodate thicker-head bolts. 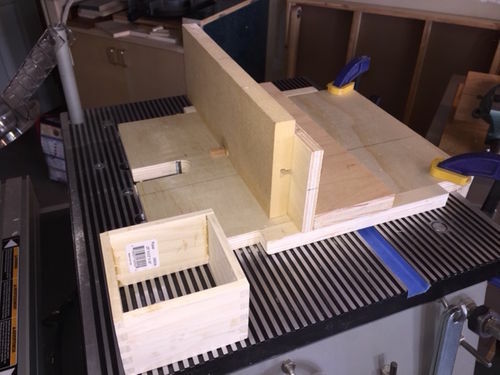 Here is my trial jig for cutting 1/4” finger joints. I found out that my up-cut bit doesn’t work in the router for this application because of it’s length. So, the only other bit I had was a non-carbide type straight bit. I touched up the cutter on the diamond stone but even then it doesn’t cut the best. Because of the bit, I am not sure this is the way to go unless I can find a short carbide cutter. I also need to learn more about how to orient the pieces as I put them thru the cutter so they match better when putting all four together. All new stuff to me. I glued up the four small pieces I put thru the jig last night to see what it would look like. Needs much improvement. Hopefully a new bit will help. Otherwise, I might need to build something to cut them on the table saw. The idea for the jig is something I found in a Wood magazine. For this trial version, I used the keyhole cutter to cut a t-slot. Then just used some flat head screws to put it together. Problems with the fit of finger joints cut like this (fence with key) usually means that you need to be more precise with your setup. The distance between the bit and the key has to be exactly the same as the width of the bit. Even a very small difference will throw the joint off and the wider the board the worse it gets because the error is additive. You usually have to test with several pieces of scrap before you get it dialed in exactly. Edit: A handy way to do the initial setup is to use another bit of the same diameter to set the space between the key and the bit in the router. It usually only takes one or two tests to get it dialed in from there. I was able to get the width of the finger cuts dialed in okay but the bit is just not cutting very well. I could feel it wanting to move my stock as it cut. If it was a good carbide cutter, probably would cut way cleaner and easier. I appreciate the info though. Thank you.